My husband and I were never big on going out for dinner on Valentine's Day. Most restaurants are overcrowded and serve mediocre prix fixe dinners. We've instead preferred to stay home and make a favorite meal together. It makes for a more intimate evening with a lot less pressure. But just because you stay home doesn't mean you should be wearing sweats or yoga pants and a tee. I've put together two casual outfits that are comfortable, stylish and are perfect for dinner at home or a casual brunch or lunch on Valentine's Day. I LOVE stripes, and by love, I mean that I have at least 20 striped tops. Not kidding. I love the crisp look of a striped top paired with jeans. My at-the-moment jeans are a pair of Old Navy flares that I bought years ago, but I am loving these Madewell flares that are currently on sale for $99!!! 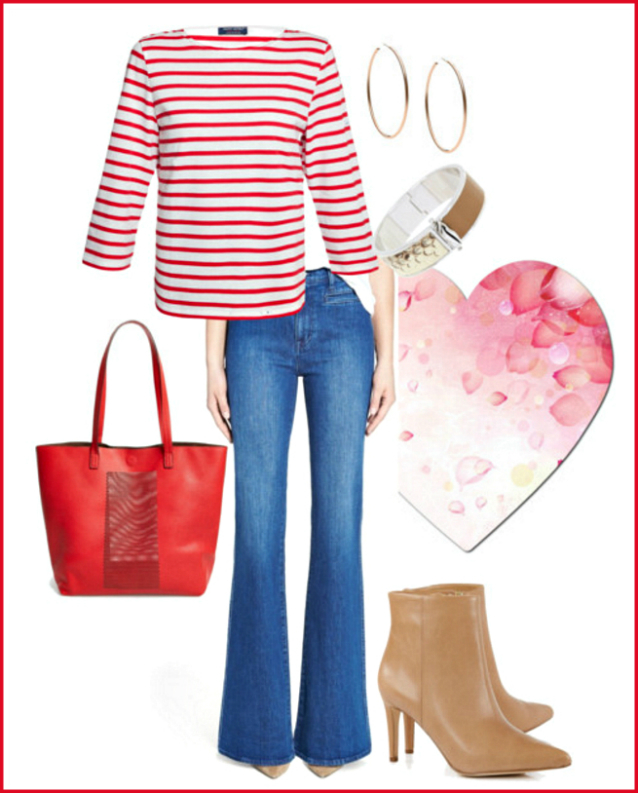 This casual look is festive for Valentine's day without being too sweet. Snuggle up next to the fire with a warm creme brulee in this cozy cable knit sweater. Skinny black jeans and ankle booties dress up this outfit and make it appropriate for a casual dinner or a night in. Both of these outfits are easy to create with items you already have in your closet. Jeans, booties, a sweater, or a top. They don't have to be exact matches. 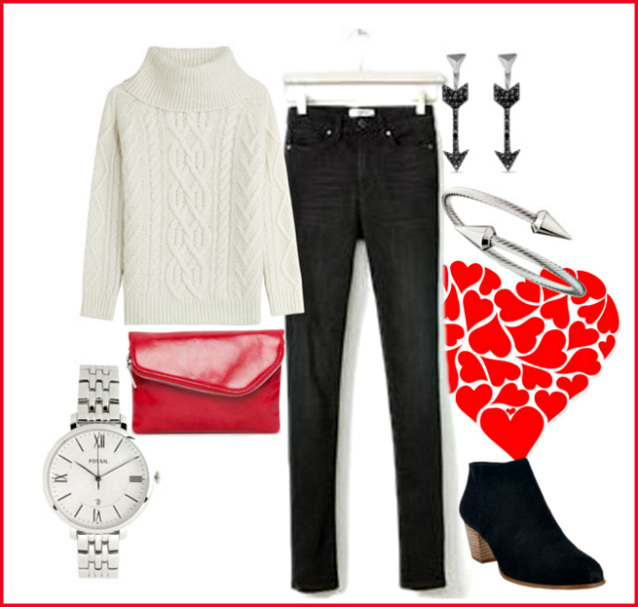 These outfits are merely meant to serve as guides as you start to put your outfit together for Valentine's Day.